I have read a book featuring Trouble before (see review here). The title: Familiar Trouble (Familiar Legacy Book 1)-Carolyn Haines. It seems that the Trouble mystery series is written by several different authors. And so far I have loved all that I have read. Dirk Hanna appeared from the federal government to discover why payments were being taken from the ranch supposedly to help veterans rehabilitate with the use of horses. This was Avery's dream--to help ex servicemen. She didn't know that the ranch had already been approved! Trouble--an extremely intelligent black cat owned by a friend of Avery showed up as Avery finally won in the divorce proceedings. He immediately had to protect Avery from her ex as any smart cat would do--then he followed her back to the ranch. You see Trouble was a cat who is very good at investigating--but even he had a bit of trouble with this one. So between being very careful near those large animals--being chased by colts across fields-Trouble has a running commentary in his mind. The ending really threw me for a loop in this one. Talk about one big twist!! Thankfully Trouble was able to figure it out before it was too late (almost) and was able to grab Dirk's attention--after all--there is only so much a cat can do! usan Y. Tanner’s latest venture is a ‘soon to be released’ romantic mystery showcasing one smart feline named Trouble. 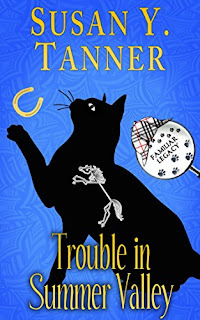 Because Ms. Tanner is a horse lover as well as a cat lover, her upcoming Trouble books will have backstories which feature the world of horses. These books will be part of the Familiar Legacy series written in concert with several very talented authors. Her previous novels, published as Susan Tanner, were historical romance. 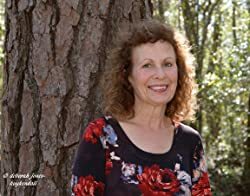 Highland Captive, Captive To A Dream, Exiled Heart, Fire Across Texas and Winds Across Texas as well as A Warm Southern Christmas (part of a Christmas anthology), were all published by Leisure Books. That cover art is amazing! Sounds like a great story.